Being a Yes fan since my early teens I was very eager for this show to come around. I got into Yes kind of late, and by the time I was starting to go to rock shows the band was starting to wind down and I missed the 'in the round' Tormato tour for whatever reason so I thought my time had come and gone. Skip forward a few years and the 90210 era rolled around and I was not too enthused about that prospect so I had been a fan for awhile by that point and STILL had not seen the band live. Fast forward to 1990 and lo and behold I hear about ABWH and get the cassette. Finally, now this is the Yes that I fell in love with and when then UofP show was announced I was stoked. Of course it was all that I expected and even more. The crowd was a bit more mature than a typical rock show but very knowledgable and appreciative. They came to be impressed and they most certainly were! The newer material went over very well and while it would had been nice if Chris would had been there, Jon and Rick more than made up for his absence. I had always been more of a Steve fan but I was just floored by Jon and his ability to hit all of those notes like it was still 1971. He is one of a kind and he has a very special gift. I don't remember too much about the show but I do remember the conversations during intermission with people who were speculating what was coming up next. 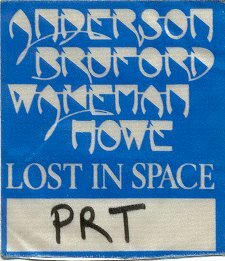 It was truly like Christmas morning for all of us who had survived the 80's and who were still pining for some good old fashioned prog rock Yes style. This concert was one of the most trancendant and revelatory experiences of my life. I was so buried in my work and out of touch that it was only by some lucky chance, which I don't even recall specifically, that I found out about it just a few days before. I did not know about and thus had not heard the ABWH record, so I heard that material for the first time played live. 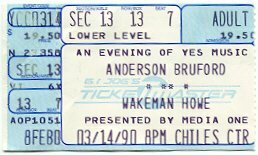 I had much previously resigned myself to the sad fate that I would never see Yes live, especially not anything close to the "classic" Yes, so this was the fruition of a dream I had not dared to envision. I was, and am, a big fan of Tony Levin as well, and had no idea he would be part of this show until I saw him walk onstage. Yes, Chris is the definitive Yes bassist, and apparently the legal owner of the name, but Tony is an equally significant bassist in the world of prog and beyond, and did justice to Chris' parts, as well as infusing his own unique style at times, although mostly in the new songs and the magnificent improv with Bruford. With Bill along, the two lended a little bit of Crimson spice, which blended with the less earthy, more ethereal, music of Yes more smoothly than one might expect. The addition of Colbeck and McDonald was wise and welcome as well, since it allowed the music to be played in full arrangements without compromise. They were both more than just able utility players, demonstrating an affinity with the spirit of Yes music which allowed them to be as much "as one" with the music as the rest of the band. I confess my prejudice that the one person who most defines and embodies Yes music is Jon Anderson. He seems to be the anchor and the inspiration of it all. His very presence was mesmerising. He has an uncanny ability to look out into an audience in a way that makes each person feel that Jon is looking you directly in the eye. This concert also captured Steve and Rick at or near their creative and technical peaks as musicians. Nothing was lacking, and nothing was over-played. While I have felt that Rick, in the past, would indulge in excessive showmanship at times, in this concert, he clearly had matured well as a performer and was a sensitive collaborator in the sound. Buying a single ticket afforded me a sixth row center seat, despite my late purchase. I walked several miles two and from the show, from the home of the co-worker who lived nearest to the venue. The solitary walk was a great medatative experience to both prepare for the show, and to linger in it's afterglow. The show itself, as I mentioned at the start, was a truly trancendant experience. The immersive and welcoming embrace of the music was almost like an out-of-body experience, and this is how it was with zero chemical enhancement of any kind (on my part). Thanks to a reasonably good soundboard recording of the Birmingham show, along with the offical live release of the Shoreline concert, I can return to this wonderful experience again and again. I've seen ABWH once in Portland, OR. When I saw ABWH, they were not on stage performing theatre to their music. They were performing music. The result was clear in the level of audience participation. We all sat. Some meditated. Some stood and swayed. Some simply watched and admired. As a result, the show was very long. And I heard things there that I had never heard before. Some examples. I would have to say that the version of "Order of the Universe" which I heard there was one of the most interestingly played versions yet. It was interesting in that it wasn't as orderly as one would expect. In the middle they switched back and forth between a "Gates of Delirium" swoosh and then a metered singing of the chorus. We were all amazed. Another example of great music. The interplay between Tony Levin and Bill Bruford. It was VERY experimental, but it had broken up the mood in such a way that it was what the audience required. The climax of the show for me was the encore, that really blew away my friend. (He was the big Yes fan back then. I had only heard a few albums, and CLOSE TO THE EDGE was not one of them.) What I heard was amazing, and after I left I went home and bought the CD with "And You and I" on it. That was when I realized how much Yes really cared about the craft of making music. As the final song of the evening, they played And You and I [Starship Trooper], but it had a twist. As the song was ending, they moved back to "Eclipse," and extended it, going through all the different key changes that eventually musically took them back to the original key signature. It was absolutely the most divinely inspired piece of music I'd ever heard. But I believe it happened because that was what the audience was there for. Shortly after Wakeman's first solo lp, A&M records issued a heavy cardboard poster with Wakeman wearing that gold lame cape and standing next to the column, its a variant of other photos, presumably from the same session. Anyway, the local record shop got tired of me asking for it every day, (we are talking 73/74) and they gave it to me. Unfortunately, I was unable to meet the band in 77, and was unable to connect over the intervening years. By 1990, however, I had my chance. ABWH was coming to Portland OR (Mar 90) and I wrote a very lengthy letter to the promoter. Lo and Behold, the night before the concert, the phone rings and my wife answered it. Within seconds, she's screaming for me to get the phone--"It's Rick Wakeman!!!!!!!!" Well, not really, it was his manager, Peter Smith. He had received the letter and setup a backstage meeting with me. Needless to say, the meeting came off with glee. First, Wakeman is just a class act. I was too respectful and he asked me to stop calling him mister, "Just Rick." It gets better, I get him to sign that poster after fifteen years, and he persuades Tony Levin, then in his briefs, to take a picture of the two of us. Finally, Jon Anderson walks in, and Rick says, "Jon, I want you to meet a good friend of mine...." I was too stunned to do anything but shake his hand, and did not get a photo. Too make a long story short, I got the photo made into a poster and my wife made about two dozen copies of the scene, including Levin's reflection in the mirror. All of the other posts reminded me that, as Jon says often, it was a magical experience.